I found a Krups cappucino machine, brand new, still in box, original selling price, $100.00. Well. $99.99. It was at the Goodwill for $49.99. Even though it's brand-new, still, that's a lot of money for Goodwill. Except that I have a punch card that is full. I can get 50% off my next purchase. I waffled about it something awful. I haven't had a cappucino machine since my last Mr. Coffee blew up. I mean, blew up with a loud bang and pieces flying everywhere. Since it was the second Mr. Coffee to explode in a two year period, I decided that there is a design flaw. I refused to buy another. I have not had cappucino since. (I figure when making your coffee becomes high risk, it's time to make a few changes.) I miss my cappucino, and I was sooooooo tempted. In the end, I felt embarrassed to spend that money on myself without talking to Tim first. We've got a lot going on here, and plenty of new expenses. It's the right thing to do. So I put the thing back on the shelf, and I left it there. Tim called on his break. I told him about it. He said, "Well, I don't think you should wait on it. Something like that might sell kind of quickly. You'd better go back out and get it right now." Tim doesn't even drink coffee. It's also below zero out there. I'm headed out right now. I'll be hard pressed to wait till morning to use it. It is kind of cool to discover at the ripe old age of 56 that I've got an artistic bent. I also have rediscovered the joy of reading in bed. Add a cup of brewed ginger tea and a little purring cat with golden eyes, and it is just about perfect. There is something very soul satisfying about hearing a little boy in his footed pajamas heading upstairs to his bedroom calling "Gramma! Gramma! Come sit with me a liddie bit." I rub his back and we talk about his day. "Gramma, he says all nestled in his warm bed, "I happy." So am I, William. Scrabble game pending with old friend to celebrate her 56th birthday Monday. Meeting up with another friend to show her a new antique store Friday. An e-mail to let me know that I'm elected to the board of the local Arts Council. Every morning when I walk into work, I am greeted by a chorus of screaming voices: "Debby here, Debby here." I'm like a rock star in the world of toddlers. Life seems chuck full of tiny joys lately. I'm very lucky. There is a sad story about a man who died in a housefire. He got his wife and son out and went back into rescue his dogs. His bearded face stares peaceably back at me from his obituary as I read that he was a man who loved his draft horses and his animals. I remember him from school a little. He was five years ahead of me. I remember something else. His brother was in big trouble a while back for allowing HIS animals to starve nearly to death. Camus said, "Life is a sum of all our choices." True that. This morning, in a far off land called Altoona, there is a girl sitting in a local McDonalds, drinking coffee, staring on into space and mentally scrolling through lists of facts and figures. In just a few minutes, she will walk into an university auditorium and begin taking her comprehensive exams, otherwise known as 'Comps'. She's been studying for these like crazy, giving up her Christmas vacation to return to her empty apartment and study alone, drinking energy smoothies and falling asleep on her couch, only to wake up, sit up and start the process again. I have great confidence in my girl. The best part is to hear her say, "I don't think that at the end of the day, I'll have anything to be ashamed of." I think that she's right. People are quite a mixed bag, and always interesting to watch. I met a woman who is an artist, teaches art within the local school system, and makes jewelry on the side. 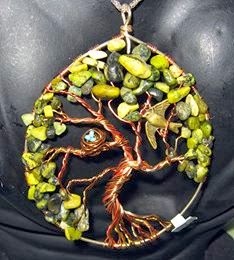 She makes an pendant called the tree of life, in many different incarnations, and for whatever reason, I am taken with this. 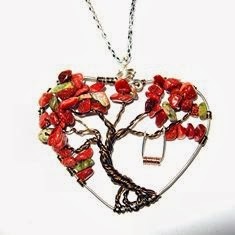 I'm not a jewelry person, except for earrings and the occasional bracelet, but I like these pendants. I have this vague idea of creating them, in a larger-than-jewelry size, and putting them on a plaque to give to my children, a reminder that they have the same roots, that we are branches from the same tree. Perhaps use the dream catcher idea, and just put them on a ribbon to be hung at a window. Not sure. But like I said, I'm taken with the idea. I don't know why I just feel compelled to remind them of that, but it is important to me. For Christmas, I bought a set of porcelain angels, exquisitely detailed, and broke the set so that each kid had an angel for their own tree, in hopes that each Christmas, they will hang that ornament remembering that the rest of the family has a matching ornament on their tree. So I struck up a conversation with the artist, and it wasn't long and I was offering to host the classes at my house. So we meet here once a week, and it is fun sitting around a table and working together, making jewelry. They hit the front door callling, "Where is my kitten!" and Paddy comes running. We are a disparate group: me, a woman I worked with long ago, a masseuse who's moved back to the area from South America, our artist friend/teacher. As we talk, we uncover connections as will happen when you live in a small town. A new student joined us, and she does not talk much, but she's easily frustrated with the process, and nervous. I wondered about her history. Being a self conscious person, I thought perhaps she was uncomfortable being in a room full of new people who all had established a friendship. I felt sorry for her a little. She complained bitterly to the teacher after class that we all talk too much and the fact that we talked about religion offended her. I was a little shocked. We talked about our faith because the masseuse was headed to Mexico on a mission trip to build a house for a ill man and his family, and we all thought that was a very cool way to spend the holiday. We talked about faith in action. It was a lovely talk. I couldn't imagine it being offensive to any one. Offended. Such a strange word. The woman comes to my house in a shirt cut down to there, with her bosom pushed up to there, her breasts in danger of spilling over and out. She has "JESUS" in great big huge letters tattooed on top of her breasts. I worked hard on my jewelry, and I tried to mind my own business, but I found myself staring at that tattoo without meaning to, and I was embarrassed that she might noticed and be offended. The questions spilled over in my mind. I was dying to ask questions about that tattoo, but I didn't, because I did not want her to be offended. But she was anyway. A simple conversation of faith and helping others offended her. People are a strange bunch, aren't they? 2014 has given every indication that it will be...well...different. Even if the changes necessary, transitions are difficult to navigate. And for the excitement of small boys on first days. There are friends who bring bear meat and books, and friends who call to say we are thinking about you. There are small moments with two people looking at each other and realizing yet again, this is the strength of a marriage ~ the ability to pull together and endure through tough times, and there is a quiet gratitude for that. This weekend was spent putting away the tree and the decorations for next year, but the house still rings with the echos of laughter and the pleasures of our Christmas season. I look around at the tidy house, amazed at how spacious it looks. I am sorry that the holidays are done, but 2014 shines with promise. Dylan and Brittani will be married in June. Cara will graduate with her Master's degree in May. There are big and public celebrations waiting to be celebrated, and there are small private victories that bring peace to my heart. A blank slate, a full box of colored chalks, a masterpiece waiting to be created. 2014 is a promise. I suppose that it was selfish, writing that last post. My daughter tells her story openly. I have never done so. Guilt. Shame. It bothers me what people think. It is partly my story, but mostly hers, and I had no right to tell it. It's been a stressful time here, one that conjures up a lot of old specters. I told too much of a story that is not my story. I apologize for a knee jerk response to a truly horrifying facebook post from some very dishonest people.